1. Building Units* — Composite panels consisting of a polystyrene foamed plastic core faced on both surfaces with min 7/16 in. thick oriented strand board. Min 3-3/8 in. thick polystyrene core Building Units* loaded to max 61 percent of the recommended axial design load. PREMIER BUILDING SYSTEMS, LLC — Type Premier Structural Panel. 2. Splines — Nom 4 in. wide by 7/16 in. thick oriented strand board splines installed between vertical joints, in pre-cut channels in the Building Units* (Item 1). 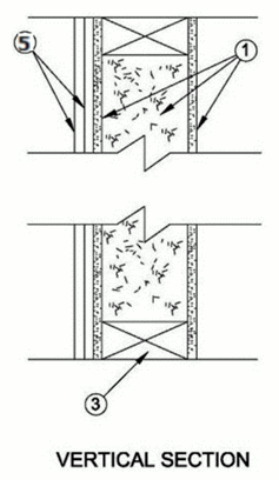 Splines secured to face in contact with oriented strand board with an adhesive (APA AF6-01 specification) and 1-5/8 in. long Type S steel screws spaces 6 in. OC along the edges of each adjoining face. 3. End Plates — Nom 2 in. thick (width determined by building units thickness) No. 2 Douglas Fir lumber installed at top and bottom of Building Units* (Item 1) in pre-cut channels. End plates secured with adhesive (APA AF6-01 specification) to faces in contact with oriented strand board, with caulk (ASTM C-834 specification) on the face in contact with the polystyrene core, and 8d box nails spaced 8 in. OC along the edges of both faces. 4. Steel Framing Members* — (Optional, when a cavity is required) — For use with Configuration C and D. Furring channels, Batts and Blankets and Steel Framing Members as described below. 4A. Furring Channels — Formed of No. 25 MSG galv steel. 2-23/32 in. wide by 7/8 in. deep, spaced vertically at max. 24 in. OC. Gypsum board (Item 5) installed vertically only and attached to furring channels as described in Item 5. 4B. Steel Framing Members* — Used to attach furring channels (Item 4A) to Building Unit (Item 1). Clips spaced vertically at max. 24 in. OC., and spaced max horizontally at 48" OC, secured to Building Units with No. 10 x 1-1/2 in. coarse drywall screw through the center grommet. Furring channels are friction fitted into clips. RSIC-1 clip for use with 2-9/16 in. wide furring channels to form a 1-1/8 in., cavity or RSIC-V clip for use with 2-9/16 in. wide furring channels to form a 1-5/8 in., cavity. 4C. Steel Framing Members* — Used to attach No. 25 MSG, 2-5/8 in. wide by 7/8 in deep galv steel furring channels to Building Unit (Item 1). Clips spaced vertically at max. 24 in. OC., and spaced max horizontally at 48" OC, secured to Building Units with 2 in. coarse drywall screw with 1 in. diam washer through the center hole. Furring channels are friction fitted into clips. 4D. Batts and Blankets* — (To be used with Item 4.) — Placed in cavities formed between the Furring Channels Item 4A, any 2-1/2 in., thick glass fiber batt material bearing the UL Classification Marking as for Fire Resistance, glass fiber batt to be compressed to completely fill the cavity between the Furring Channels. See Batts and Blanket (BZJZ) Category for names of Classified companies. 4E. Steel Framing Members* — Used to attach No. 25 MSG, 2-1/2 in. wide by 7/8 in deep galv steel furring channels to Building Unit (Item 1). Clips spaced vertically at max. 24 in. OC, and spaced max horizontally at 48" OC, secured to Building Units with 2-1/2 in. coarse drywall screw through the center hole. Furring channels are friction fitted into clips. a. Resilient Channels — Formed of No. 25 MSG galv steel, spaced 24 in. OC, and perpendicular to studs. Channels secured to Building Unit (Item 1) as described in Item b. Ends of adjoining channels overlapped 6 in. and secured in place with two No. 8 15 x 1/2 in. Philips Modified Truss screws spaced 2-1/2 in. from the center of the overlap. 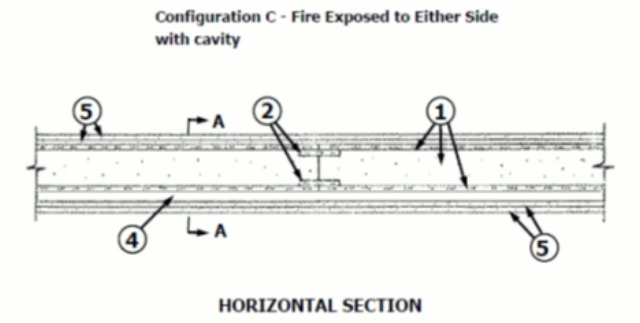 Gypsum board attached to resilient channels as described in Item 5.
b. Steel Framing Members* — Used to attach resilient channels (Item 4Fa) to Building Unit (Item 1). Clips spaced 48 in. OC., and secured to Building Unit (Item 1) with No. 8 x 2-1/2 in. coarse drywall screw through the center hole. Resilient channels are secured to clips with one No. 10 x 1/2 in. pan-head self-drilling screw. 5. 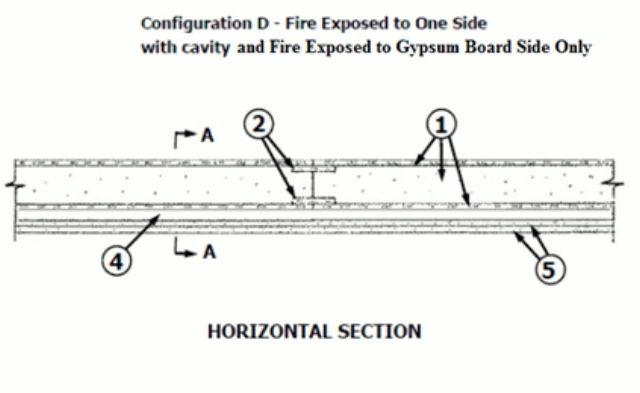 Gypsum Board* — For Configuration A and C, 5/8 in. thick, 4 ft wide, applied vertically in two layers to both sides of the assembly. For Configuration B and D, two layers applied to one side of the assembly. First layer installed with 1-5/8 in. long Type S steel screws spaced 24 in. OC vertically and 16 in. OC horizontally. First layer vertical joints offset min 16 in. 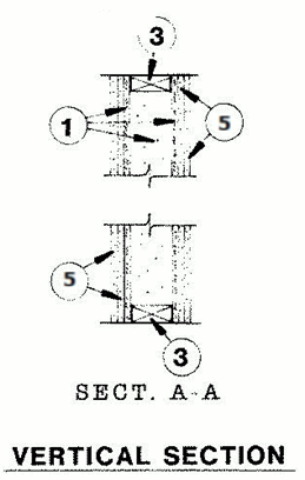 from vertical spline joints of Building Units* (Item 1). Second layer installed with 2 in. long Type S steel screws spaced 12 in. OC vertically, offset 12 in. from first layer screws, and 16 in. OC horizontally, offset 8 in. from first layer screws. Second layer vertical joints offset min 16 in. from first layer vertical joints. Outer layer wallboard joints covered with joint tape and joint compound. Screw heads on outer layer of wallboard covered with joint compound. CONTINENTAL BUILDING PRODUCTS OPERATING CO, L L C — Types LGFC6A, LGFC-C/A.